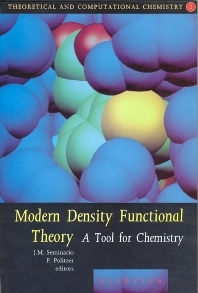 An introduction to density functional theory in chemistry (J.M. Seminario). 2. Semilocal density functionals for exchange and correlation: Theory and applications (K. Burke et al.). 3. The local-scaling version of density functional theory: A practical method for rigorous calculations of many-electron systems (E.V. Ludeña et al.). 4. Towards a practical algorithm for large molecule calculations (Z. Zhou). 5. Symmetry and density-functional exchange and correlation (B.I. Dunlap). 6. Development, implementation and applications of efficient methodologies for density functional calculations (B.G. Johnson). 7. DMol, a standard tool for density functional calculations: Review and advances (B. Delley, P. Scherrer). 8. Constrained optimization procedure for finding transition states and reaction pathways in the framework of Guassian based density functional method: The case of isomerization reactions (Y. Abashkin et al.). 9. The calculation of NMR and ESR spectroscopy parameters using density functional theory (V.G. Malkin et al.). 10. Density functional theory and transition metal oxides (E. Broclawik). 11. Density functional studies of decomposition processes of energetic molecules (P. Politzer et al.). 12. Density functional theory: Further applications (P.B. Balbuena, J.M. Seminario). Index. Density Functional Theory (DFT) is currently receiving a great deal of attention as chemists come to realize its important role as a tool for chemistry. This book covers the theoretical principles of DFT, and details its application to several contemporary problems. All current techniques are covered, many are critically assessed, and some proposals for the future are reviewed. The book demonstrates that DFT is a practical solution to the problems standard ab initio methods have with chemical accuracy. The book is aimed at both the theoretical chemist and the experimentalist who want to relate their experiments to the governing theory. It will prove a useful and enduring reference work.